I won't be back. I imagine they will be very convenient to those who live in the area. The location is excellent, the store is clean. I suggest if you are not local, this establishment is not worth trying, certainly not worth a road trip. To my knowledge this is only dispensary in this area, and it shows in their lack of service. I can't speak about the quality of the product, I didn't buy any product .... I have plenty! These guys act like they are the only dispensary in the state, lol. The crew at Elevated are #1 in my books. They are always helpful and super knowledgeable. This is my go to one stop shop ! Been here several times. The people seemed friendly at first then seemed to start giving me the cold shoulder. The quality in bud has already gone down tremendously. Prices are too high as well. $52 with tax for an eighth here but I can drive a little farther and pay $35 an eighth and it’s 2x as good. Place has potential though. This is a Grade A joint with a staff full of great people and Top Shelf product. Any and everybody in the area should come and Get Elevated. great atmosphere! friendly staff. always happy with my purchases! So proud to hear you leave happy every time! Thanks for the review. Come see us again! good flower.. and best prices !! my new spot !! Thanks for the review Weedman! Come hang out whenever! Love Love Love this place ! We love having you! Come back and see us. The staff is chill but knowledgeable. 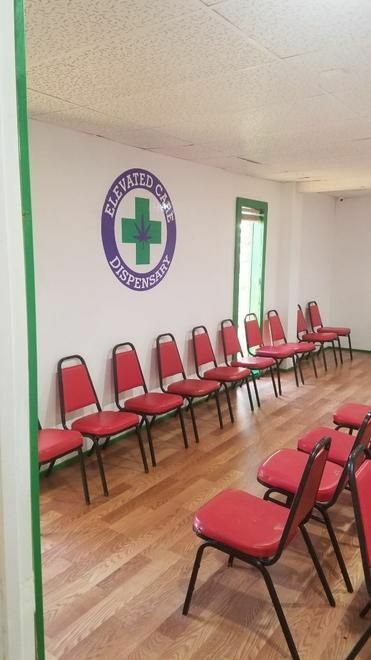 They always seems interested in what customers are discussing and are willing to engage in conversations that are social and medicinal. Thanks a lot for the review. Any time you want to come in and chat feel free to stop by.